Booksellers, like the writers whose works they peddle, are notorious gossips. But unlike writers who never miss an opportunity to scribble down anything and everything, booksellers almost never write their memoirs. They mostly dissipate their vast hoard of anecdote and story entertaining their colleagues in late night sessions in bars. Then they die and it's all gone. While there are many valuable scholarly, historical or bibliographical volumes written by members of the trade, there are probably — and I include both England and America — not a dozen good memoirs of booksellers in the entire twentieth century. I have always found great irony in this melancholy fact: that in a trade whose whole raison d'être is focused on the rescue and preservation of the past, significant members have not seen fit to record the anecdotal history of their own personal past. For that reason, when a new memoir by a bookseller of the stature of Anthony Rota appears, there is great interest in the trade. I should start by confessing that I am unable to write an objective review of this book, and in fact, I'm not going to try. Instead I shall state bluntly that this is a wonderful book and I shall to try to tell you why you should want to read it. Rota is the principal of Bertram Rota Ltd., founded by his father, but his trade connections, as they often do in England, stretch far back, including his great-grandfather who was the scholar bookseller Bertram Dobell. Indeed, as he points out in the subtitle, he is a fourth-generation bookseller. The firm of Bertram Rota Ltd. would be considered by many collectors and most of the trade to be the preeminent dealers in Britain in modern literature. That is to say, the best, if not the largest or the flashiest. Rota begins his account with a prologue which, through old diary notes, relates an actual week in his shop, and which effectively conveys some of the things that can occur in a bookshop during such a period. This account is tinged with sadness for me because one of those days is spent travelling to consult about the dispersal of the library, after his death, of his old friend [and mine] the poet, writer and book collector Kenneth Hopkins. Hopkins, a man of great charm and enormous learning, was poor all his life except in friends and books. He wrote several books on the history of English poetry and several volumes of poetry himself. He once published [in Toronto, incidentally] a pamphlet with some newly discovered poems by the Roman poet Martial which were very favourably reviewed in an academic journal, a review which greatly delighted Kenneth since the publication was a fraud, all the poems attributed to Martial having been composed by Kenneth himself. They were good poems too, even the reviewer said so. Hopkins, too poor to collect the major poets in England, got the idea to build a collection of minor poets of the nineteenth century. During many years haunting bookshops, he had bought every book of nineteenth-century poetry he saw which was by an obscure or unknown poet. Because of this Hopkins had a comfortable old age, for after many years amassing this huge collection, Rota sold it for him to an American university that like most of the others had neglected the minor poets while they sought the major ones. At the risk of appearing to be one of that ignoble breed, a punster, I cannot help saying that this seems to me to be a perfect example of 'poetic justice'. This is also one of the best examples I know of which confutes the erroneous view that one must be wealthy to build an important collection. Not money but imagination and passion are the real essentials of successful book collecting, as Hopkins proved. He ended his life travelling, dining with friends and, of course, buying books. Rota reports that despite the space created by such a massive sale, at his death Hopkins' house was once again overflowing, bursting with books. The book trade is different in Britain than here in North America and there are various possible explanations for this being so. My own view is that a couple of hundred years gives a pretty good head start; but to this I would add the apprentice system which old fogies like me and Anthony Rota believe to be essential to form a properly rounded dealer. Along with a general history of Rota's firm, its ups and downs, triumphs and defeats and moves and moves and more moves (the bookseller's horror) Rota provides vignettes and anecdotes about a huge array of dealers, scouts (runners in Britain), collectors and librarians from that vast horde of interesting and eccentric characters who make the antiquarian book world so fascinating to those who inhabit it. Rota's book also gives a clear view of a fairly long period in the British trade. What was especially poignant for me was anecdotes about people I dealt with but never met. For instance, Laurie Deval who traded, along with the famous Percy Muir, as Deval and Muir, and who died way too young (fifty-eight). Rota describes him as 'first rate and very shrewd'. If 'shrewd' means he had an eye for the curious (not curiosa, the trade euphemism for erotica) and the out-of-the-way-book, I would agree wholeheartedly. But shrewd about money he certainly didn't seem to be. His catalogues were amongst the most interesting I ever received and I bought lots of things from him at what often seemed ludicrously low prices. But I never met him and it's good to find out from Rota that I would have liked him as much in person as I did his fascinating catalogues. Another of these dealers was the inimitable Alan Thomas, whose eccentricities were famous. Thomas wore a huge beard and as Rota says, 'later in life took to wearing a deerstalker hat and an Inverness Cape ... and a richly embroidered waistcoat that had once belonged, to William Morris.' His catalogues of mostly early books and important Bibles and Theology were remarkable for their astonishing depth of scholarship but also for Thomas's pungent and very witty descriptions of his books. If you think it's easy to be witty about some obscure sixteenth-century religious controversy, try it sometime. Thomas warmed the hearts of booksellers everywhere in a speech to the Grolier Club where he claimed that bookselling 'was virtually the last calling where a man could be master of his own destiny' a thought which continues to sustain me whenever I'm going through a bad patch. I once had a correspondence with Thomas relating to his lifelong friend Lawrence Durrell and he was as warm and generous as Rota says he was. So important were his catalogues that a run of them itself sells for a fair amount of money. In one place Rota tells us of an accusation made against him by a young American dealer that he was born to the manor, so to speak, having taken over a flourishing business after his father's untimely early death. 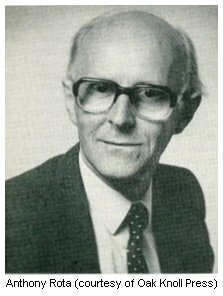 Rota, without a trace of bitterness, points out that what he was actually given was 'his own set of keys so he could be the first one in to work every day and the last to leave at night, a few shares in what was a public business, and a wonderful loyal staff.' He then goes on to tell us that the real gift his father left him was his extensive group of friends, the major dealers of that time and now the legendary giants of that generation. Of course Rota knows that we will understand that while your father's name may get you in the door, you'll still need to deliver. Father's friends or not we all only give our own friendship to those who earn it. That all these men also became Anthony Rota's friends too tells us plenty about him. And the fact that the men he names, although they won't be widely known outside the trade, except to their own customers, were amongst the most highly respected dealers in the trade, as was Rota's father. I see I have spent too much time on my own recollections of the people Rota mentions. But I couldn't help it and neither will other bookmen be able to. This book will stir different memories in different bookmen. I have only scratched the surface here. His chapter on auctions is interesting; the ones on The Ring and the Joseph scandal are fascinating. Dealers will get new details, others will get new history. Not a lot has been written about The Ring and even less as bluntly as Rota puts it. If you read this book you will learn a lot about the book trade. Rota inserts numerous short anecdotal pieces between chapters, things which are worth recounting but are outside the narrative flow. In one of these vignettes he brilliantly skewers the pretensions of a very famous bookshop. In two short paragraphs, if you can read between the lines, he tells us all we need to know about this firm, even the sin which justly brought on the skewering. I've been testing my clients and colleagues to see if they got it; see if you do. I hope I am not giving the impression that this memoir is a book only of interest to insiders for this is not true. Indeed, you don't even need to be a bookseller or collector. If you are an academic or other kind of scholar you will find in these pages how and by whom so many archives of well-known English writers were sold to North American institutions. Rota has long specialized in this. Placing archives in institutions is hard work because they are often worth a lot of money and while money is usually understood by the people who control university funding, they don't often understand literature. So if you want to find out how such writers' archives were routinely passed on from the writer to the mostly North American universities that now hold them in trust for future scholars, you will find here as good an account as anywhere. And of course, as a bookseller I can't help pointing out that all the scholars in the world and all the money available to rich institutions are useless without the knowledge, experience and integrity of dealers such as Rota. Rota even dwells on his defeats, on the archives he missed out on, admitting how painful it was to lose the opportunity of selling the archives of Evelyn Waugh and Vladimir Nabokov, the former won by a dealer representing the University of Texas, included even Waugh's desk and the shelves from his library, and the Nabokov archive which went through another dealer to the Berg collection in the New York Public Library. And yet what does appear clearly and regularly and perhaps not intended by Rota, is a history of integrity and fair dealing, and, most important, fair dealing according to a belief in the traditions and continuity that should fuel the book trade. On page after page the same subtext is unmistakable; there is a proper way for a dealer to act and a moral obligation to act thusly. And Rota clearly does. About a dozen years ago Rota published a piece in a trade magazine on the protocols of the trade, outlining his views on how dealers should act with each other, especially in other dealers' shops. I was so intrigued with this that I copied it, and took to showing it to other dealers, mostly young ones, to see their reactions. Of course the result should have been expected. Rota (and I, by implication), were dismissed as boring old pedants, irrelevant to the real purpose of bookselling, which currently seems to be getting rich by offering perfect copies of obvious books by the obvious greats of literature, at increasingly ludicrous prices. Rota is much more civilized than I. He handles such criticisms by referring to the booksellers who make them as, 'having a different philosophy than I do about bookselling'. I wish I had thought of saying that. And, as Whistler famously said to Oscar Wilde, given a bit of time, I'm sure I will. If I have one complaint to make about Rota's book, it is the paucity of stories about the legendary Anthony Newnham, a fellow director of his father's firm and his friend. Newnham's picture is present in the book where he appears to resemble some sort of innocent Dudley Moore, while enough detail is provided to illustrate that he was an extraordinary bookman. But there aren't any of the great stories that get passed on about him in the trade. I met Newnham at a book fair in San Francisco. I was taking to lunch Franklin Gilliam, the proprietor of the Brick Row Bookshop, another mutual friend, and as civilized a man as you could find, a man who could handle a four-martini lunch with no apparent effect, except he became even more civilized. Newnham invited himself along and before we reached the restaurant had invited every other dealer and collector we met, some dozen people. He had in tow his current wife (his fifth, I believe) who never opened her mouth, spending the entire meal staring adoringly at Newnham as he regaled the table with endless, very funny and scurrilous stories, and then followed him meekly as he departed, seemingly completely unaware of such vulgarities as the restaurant's bill. I paid his bill and considered it an honour to do so. I still do. Perhaps it is a reticence born of friendship that causes Rota not to tell us more about this extraordinarily colourful bookman. Or maybe it's just that most of the stories he could tell would be unprintable. Rota has made a wonderful contribution to the history of the trade in our time and in doing so he has brought, in my opinion, great honour to himself, to his father's legacy, and to the firm of Bertrand Rota Ltd. And, not least, to the trade that we both practise. Reading his book has made me prouder to be a bookseller than I was and I thank him for that as I commend his book to you. And it's also nice to be reminded with such wit how much fun we booksellers have. It is fitting that in spite of the worldwide respect in which he is held, in both the trade and amongst those collectors and institutions he has so well served, perhaps Rota's greatest reward will be that his son, after serving his own apprenticeship elsewhere (another established tradition of the trade), has now also joined Bertrand Rota Ltd. So the succession is assured and Anthony can look back on his efforts knowing that his influence will extend, just like his father's, long after he is gone. Of course as I told him in a note sent after I finished the book, I can't wait to get him over a good meal and a few bottles of wine so I can wheedle out of him the only thing he left out: the really scurrilous stories: the gossip gathered in a lifetime of passionate curiosity.